Burning Hearts House of Prayer – Melissa David joining us from Healing Melodies ministries for a Harp & Bowl concert. See details below. Melissa David joining us from Healing Melodies ministries for a Harp & Bowl concert. See details below. 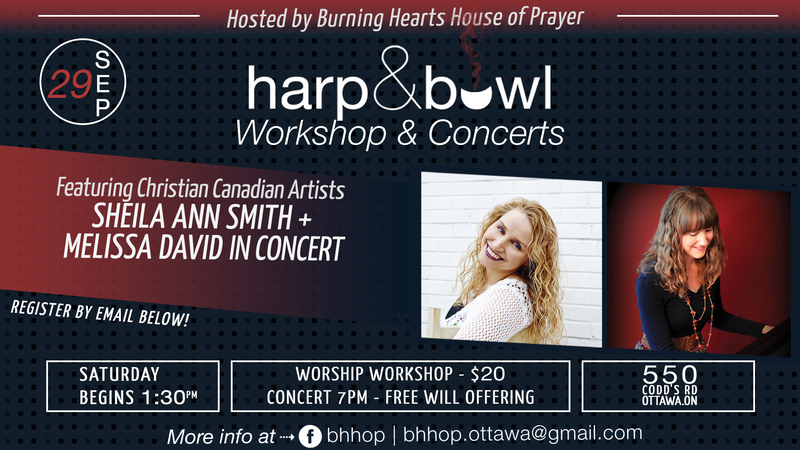 Coming off the heels of a beautiful night of prophetic worship in Edmonton, Alberta, I’m excited to announce that I will be ministering at the Burning Hearts House of Prayer in Ottawa, Ontario this September 29! “Harp and Bowl” worship and prayer is a huge part of my ministry vision, having spent a season of time at the International House of Prayer in Kansas City (IHOP-KC). Share this event with anyone who loves to hear the Scriptures put to song and to pray, journal, and soak in the Lord’s presence.